JOYGIFT Smart Watch TouchScreen Bluetooth SmartWatch Waterproof Sport Wrist Watch With Camera SIM Card Slot for Men Women Kids,can dial via sim card or Bluetooth optional, has many functions like: Incoming message and call remind, Pedometer, Calories Calculation, Sedentary remind, Sleep monitoring, Remote photos, Music playing, Alarm clock, Anti-lost, Voice Recorder and so on.  Two Working Modes - Bluetooth Mode: our Bluetooth smart watch is enable to make call or receive call, send or get message etc via Bluetooth. Network Mode: you need to install GSM 2G sim card into the smart watch, then the smartwatch can be used as a phone. Please make sure you have a postpaid sim card, GSM 850/900/1800/1900 MHz, single micro sim card. Great Compatibility - Our Bluetooth smart watch can perfectly work with android smartphones & tablet PC, like Samsung, Nexus, Huawei, HTC, Sony, LG, OPPO, Xiaomi and so on. For IOS system, it only supports to make and answer calls, sync contacts, and play music via Bluetooth. 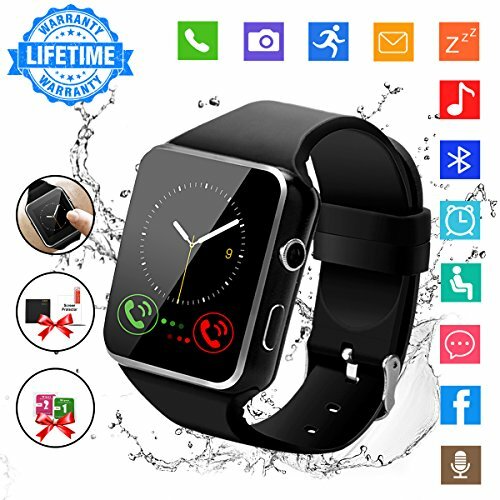 Multifunctional Smart Watch - This smart watch has so many functions like Bluetooth Dialer, Call Reminder, Bluetooth Call, SMS, Caller ID , Remote Capture,Calendar, Audio and Video Player; Health Management: Pedometer, Sleep Monitor, Sedentary Reminder. HD Touch Screen - 1.54" TFT LCD 2.5D radian capacitive tousch screen with 240 x 240 pixels, OGS laminating process. The strap of our smart watch is adjustable, but can't be changed. Fashion Smart Watch and Great Customer Service - We will offer you Lifetime Warranty of our Bluetooth smart watch, so just purchase our smartwatch without any worries. Our Bluetooth smartwatch is a good gift for you,your family and your friends!